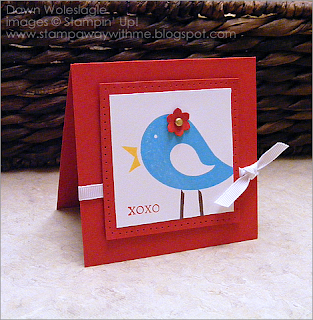 This card was one of the 4 I made for Kristina Werner's Color Inspiration Challenge # 50. I stumbled upon her site a couple of weeks ago, and must say I really spend more time there now than I should. Shh...keep that between you and I, remember, I'm a closet stamper. OK, back on subject. We could only enter 1 card and this one was the runner up. What I really like about this card is it's versatility. I used the Just Be stamp set, which comes with a ton of words to be combined with "B". (Happy, is for birthday, is for baby, Mine etc...) For this particular layout, you could easily make a 6 pack or so and just switch out the word and you'd have a set of all occasion cards. 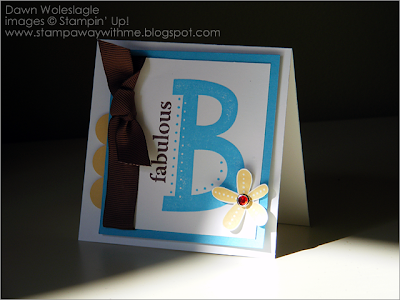 Leave off the word "fabulous" in this case and it could be for a baby boy card, switch the turquoise to pink and it becomes a baby girl card. OK, enough rambling from me. Here's my submission for Kristina's 50th Color Inspiration challenge. This color combo was much more fun than I thought it would be. I actually ended up with 4 or 5 cards! I could only choose one to submit, so here it is. I will be back tomorrow to update the supplies...must go to bed now. TFL! Back to add details on supplies as promised. Have I mentioned I am now obsessed with 2 things. Whisper White card stock (I think I've used a whole pack in the last week), and color-on-color layouts. Something about the monocramatic layout is so clean. Anyway, here are the supplies used for this card. Have you ever seen something, wanted to CASE it, but just couldn't bring yourself to change it? Because it's perfect just the way it is. Well, that's the case with this card. 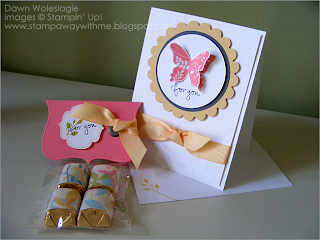 My up-up-line sent me a card and I just LOVE the layout. I knew I had to make one. So I decided to keep the layout and only change the colors, stamp, and sentiment. Then I decided to make a matching treat bag. 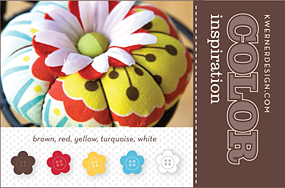 What a great way to showcase product from the Occasionals Mini. Hope you enjoy! Whew! What a month. I finally have my "stamp room" back, which happens to be cleverly disguised as a dining room. I'm not so lucky to have a whole room dedicated to crafting. I tried to move the boys to share a room, but the husband vetoed that one. What?! OK, so maybe that's taking it a bit far. Anyways, the new floors have been layed and I LOVE them!!! If you are in the Jacksonville area, I HIGHLY recommend Johnson's Woodworking. They are fabulous, and they come back in another 3 weeks to do the kitchen. But I did get a chance to stamp something last night. 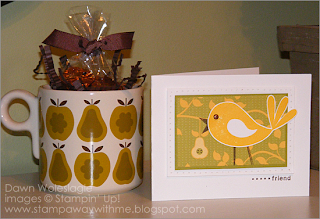 I found this coffee mug at Target last night and couldn't believe how well it matched the Stampin' Up! designer paper Good Morning Sunshine. Notice the pears on the paper and mug. 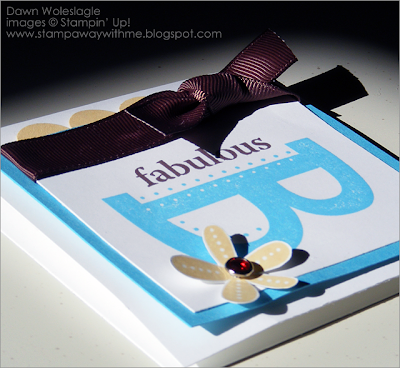 Sorry I have not posted in a bit, but I am currently on a stamping hiatus. Not by choice, believe me. I think it is the only thing that keeps me sane. However, we are in the process of a pretty big renovation project. We are removing 1,000 square feet of carpet/tile and replacing with wood floors. And, as if that is not enough, we are also completely re-doing the kitchen. I will post pictures soon for those interested! On a blog note, I have a ton of ideas for the site. 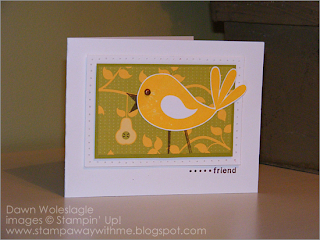 I would like to start making my little corner of the web more interative by posting tutorials, techniques, challenges, and featuring fellow stampers and crafters once a week. I would love to get some ideas from you on what you would like to see here. So if you read, and you have requests, please comment and leave your suggestions. I plan to come back full force once I get some room back in my house to actually move around!